Ben Kite was born in 1970 and joined the Royal Military Academy Sandhurst in 1989, commissioning into the Intelligence Corps in 1990. His early military years were spent commanding infantry, EW, SIGINT and Military Intelligence soldiers in Germany, the UK and on operations in Belize and Bosnia. As a Captain he held appointments as the Intelligence Officer for the Special Boat Service, 24th Airmobile Brigade (in the UK and Bosnia) and was also a J2 staff officer within the US-led Headquarters for Operation PROVIDE COMFORT in southern Turkey/northern Iraq. He further broadened his career through service as an instructor at The Royal Military Academy Sandhurst and by an attachment to the South African Army, where he helped integrate ANC members into the fledgling, post-apartheid South African Defence Forces. After a tour with 7th Armoured Brigade in Kosovo in 2001, he attended the Advanced Command and Staff Course and obtained an MA. Following Staff College he commanded a Military Intelligence Company in Germany and Iraq and was posted into the Directorate of Army Plans where he drafted the Army Plan. He was promoted to Lieutenant Colonel in 2007 and served as an SO1 J2 at US CENTCOM. Command of 4 Military Intelligence Battalion followed shortly thereafter in 2008. This unit swiftly became involved in transforming the standard of tactical intelligence in Helmand, creating the Land Intelligence Fusion Centre (Afghanistan) and a new breed of Intelligence Support Teams that operated at Company/Platoon level. For their contribution to operational success in Afghanistan 4 Military Intelligence Battalion was awarded the Freedom of Marlborough and Ben Kite the OBE. On promotion to Colonel in 2011 he served as the Deputy J2 in ISAF Joint Command, Kabul. 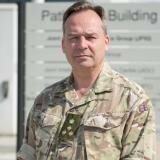 On his return to the UK he was appointed as ‘Colonel Army Strategy’ - the Head of the British Army’s personal initiatives and engagement group. He was selected for the UK’s Higher Command and Staff Course which he attended in 2014 and was subsequently posted to the United States as Director Plans and Training of the US Cyber National Mission Force and CYBERCOM’s Senior British Military Advisor. He was appointed as Commander of the Joint Force Intelligence Group in May 2016 and promoted to the rank of Brigadier. Ben Kite is married to Elsa and has two daughters, he sails and fishes but his primary passion is military history. His first book ‘Stout Hearts – The British and Canadians in Normandy 1944’ was published in November 2014. Check out the incredible speaker line-up to see who will be joining Brigadier Benedict.